I have to tell you wine glasses and counter-tops have feelings too. Go ahead and laugh at that because I am laughing as I am writing. You know, truth of the matter is, we dress things up so much in our kitchens to make everything look a certain way, that when you introduce something as simple as a cardboard box to the counter it kind of takes away from the flair, the look, the ambiance. What am I talking about? Are you a fan of boxed wine? Boxed wine is a wonderful way to tote you favorite wine to someone’s home, and often it converts to 4 bottles of wine + making up one bag. The price of boxed wine is often so much more lavish than the price per bottle, and depending on the brand you purchase it can often taste better than some of the bottles offered. What makes boxed wine nice is not only it’s price that is without luxury, but its method of open and serve. Many times however, the box just looks out of place on a counter top and remember I am all about the lavish side of things, so making wine look as good as it tastes is all part of the lavish presentation. What if you could take your basic wine in a box and convert it into a premium Bag-In-Box Wine Dispenser that actually graced your counter-top and took away the look of the cardboard box while replacing with a great stainless steel lavish dispenser? Lavishly live boxed wine out loud, with a luxury Bag-In-Box Wine Dispenser. I once had a friend who loved her boxed wine, but hated the dispenser it came in, because cardboard while earth friendly is totally not kitchen fashion forward. She would paint the boxes and add bows to disguise the box and other times she would simple pump all the wine into carafes. However, this often backfired on her because the wine was left and only lasted a few days before going bad as the air gets to that wine in the decanters. Making those mistakes a few times, she then decided to cover the boxes with wrapping paper. I thought that was ingenious, until….. someone used the tap, it leaked on the counter, under the paper and the paper dried, stuck and left images of what the wrapping paper had on it. A great idea, gone bad. Here is what she needed to help her rid that look of the old cardboard box and add a little coiffe to her counter-top. Love White Wine and Red Wine as well? Do you purchase those boxed wines because you have lots of company over and the boxed wine is the best way to lavishly live those fun times out loud? Well, cardboard box dispensers are the way the wines come, but who says we have to settle for the packaging and its look? Let’s style the wine back up a little bit, and rid it of it’s cardboard outer, place it in a stainless steel dispenser and let it look as good as it tastes. Are you ready? Meet Boxxle. This dispenser is easy to use. It is always with you, it never gets thrown away and it will grace your counter-top with a sleek looking appearance. Simply purchase that boxed wine that you love, open the boxed wine box, take out the sack of the box. 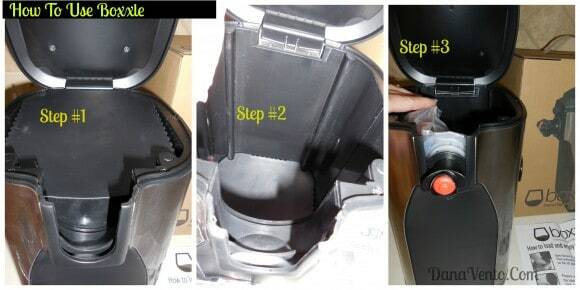 Open the Boxxle dispenser, (Step #1), See the plate, push down on it, this is a preload lifting mechanism, push down on it and you will hear it lock into place(Step#2), then load your bagged wine with the nozzle placed into the groove(Step #3) That’s it, you are ready to dispense and enjoy your wine. The plate lifts a little at a time providing all the wine in the bag into your glass. 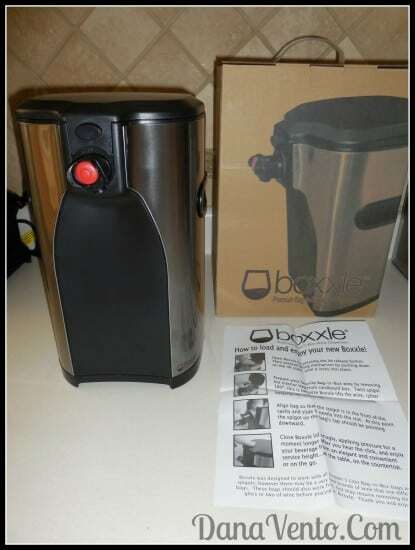 The Boxxle does not have to sit on the edge of your counter because the nozzle(spigot) is up high. IN fact you place your glass under the spigot and dispense! The spigot is already on the bag, so each time you load a new bag, you adjust the spigot into that hole. Lavishly live your boxed wine out loud ,with a premium, lavish dispenser that adds a little personality to that basic cardboard box. 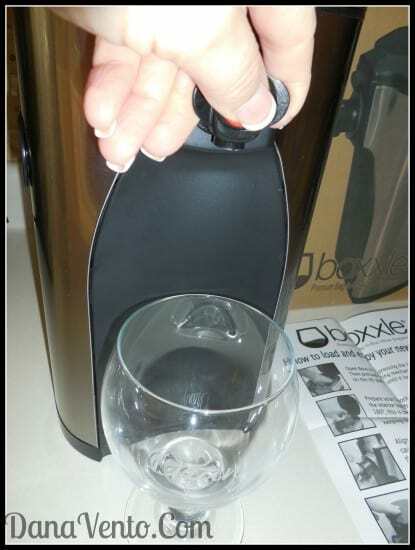 Dress up your counter-tops and kitchen with a clever device that lets your glass celebrate everytime wine rims the glass! Do not drink and drive, you must be of legal drinking age in order to consume alcohol and pregnant women should not consume alcohol. When I looking around to find a good article about boxed wine I stumble with your site and read the proper function about this product. There was a lots pictures that most viewers understand very well. I love this product too when preserving wine box, it save a lot of money and time when you used your way to serve well.